Starbucks has something new for you to try: It is Toasted Coconut Cold Brew! Starting today, you can add Toasted Coconut syrup to your world of Starbucks drinks. Starbucks is featuring this with the classic Colombia Nariño Cold Brew coffee, but you can experiment with it – You might like it in a Frappuccino, in black tea, or even in a Mocha! 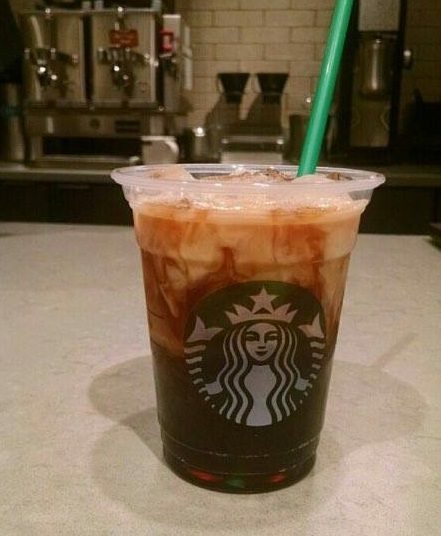 The new featured drink is Toasted Coconut syrup mixed with Starbucks signature Nariño 70 cold brew and topped a splash of coconut milk. The coconut milk gives it a layered effect look and nicely complements the other elements. You’ll find that Toasted Coconut syrup adds a nice touch of sweetness to this drink. I tried this drink and think it has a one-of-a-kind flavor. It’s hard to put my finger on it. It’s delicate and sweet, but I almost got a hint of floral flavors when I tried it. I wanted to hear what you think of Toasted Coconut syrup! A few days ago I wrote about the Cocoa & Honey bottled Cold Brew! That is so good! If you find the new Cocoa & Honey Cold Brew at your local grocery, give it a try! It’s one more way to enjoy cold brew coffee on the go. Once again, Starbucks misses the boat on the coconut flavor. Tastes far too floral, which IMO doesn’t work great with coffee. It’s a shame, because coconut is one of my favorite flavors but their competitors beat ’em this go. I loved it, and I’m usually an iced Americano or Doubleshot on Ice girl. And, if the nutritional information is right, it’s only 50 calories for a grande. Toasted coconut syrup sounds good, but in practice not toasty, coconutty or sweet IMHO. In cold brew it was blah. I had it substituted for other syrup in frappuccino and MAYBE it was floral, as other poster mentioned but mostly it was flavorless. One associate mentioned that the coconut syrup pumps are smaller than than other flavors. My view is this may keep down the calories, but also limits aroma and taste. Coconut is a great idea for drinks of a tropical/pins colada nature for sunny season. Try again, Starbucks, please; now just a work in progress. This is my favorite Starbucks drink right now. I hope it stays around for a while, but it sadly seems like it’s not too popular. It’s the perfect balance of sweet and bitter for me. I’m an “iced coffee with milk” or Starbucks Doubleshot person, and it seems like people who prefer unsweetened or less-sweet drinks like this one more than folks who prefer a caramel macchiato or vanilla latte.